Wind turbine south of Highmore, South Dakota. 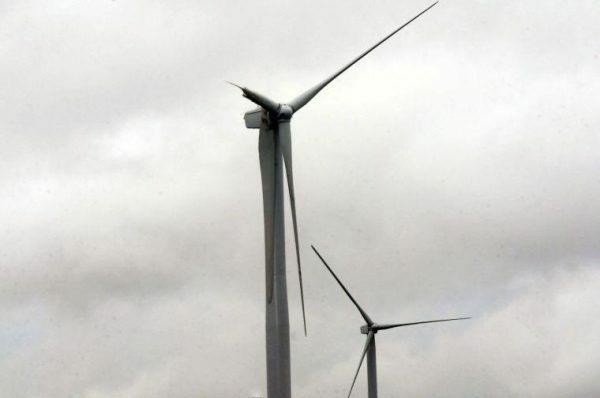 The South Dakota Public Utilities Commission has granted a permit for Deuel Harvest Wind Energy LLC to construct a wind farm. The proposed wind energy facility will feed into a 345-kilovolt transmission line in Deuel County. A kilovolt is a unit of electrical potential equal to 1,000 volts. The PUC accepted a filing fee of $400,000 with an initial non-refundable deposit of $8,000. The application is to construct the wind farm and transmission line. This facility is on approximately 48,730 acres of land in Deuel County in the townships of Portland, Lowe, Altamont, Glenwood and Herrick. The total installed capacity of the project would not exceed 310.1 megawatt capacity. A megawatt is equivalent to one million watts. One megawatt is equivalent to the energy produced by 10 automobile engines. A megawatt hour is equal to 1,000 kilowatts of electricity used continuously for one hour. The proposed project includes up to 112 wind turbine generators, access roads to the turbines and associated facilities, underground electrical power collector lines connecting the turbines to the collection substation, an operation and maintenance facility, and temporary construction areas, including crane paths, public road improvements, a laydown yard, and a concrete batch plant, and four permanent meteorological towers. The project would interconnect to the regional electric grid along the Big Stone to Brookings transmission line via a new substation located in Glenwood Township. This will require installation of approximately 150 feet of overhead transmission line. A public input hearing is set for January 24, 2019, in Clear Lake. Deuel Harvest Wind Energy LLC is actively marketing the sale of electricity from the project to third parties.